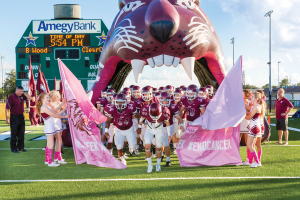 The Clear Creek High School Wildcats make a move to fight both breast cancer and their football rivals during Clear Creek High School’s game against Brazoswood on Oct. 9. 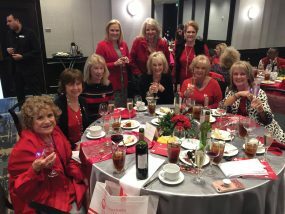 MD Anderson in the Bay Area formed a partnership with the school to raise visibility throughout the community as part of Breast Cancer Awareness Month, and during the school’s “Pink Week at Creek” campaign. MD Anderson physicians were on hand that night to share material and answer questions. 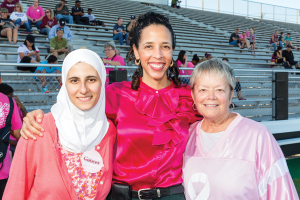 From left, MD Anderson physicians Sausan Abouharb and Valerie Reed joined with Ann Hammond, Clear Creek ISD board president and breast cancer survivor, to address the crowd with a message about breast cancer awareness during Clear Creek High School’s football game against Brazoswood on Oct. 9. 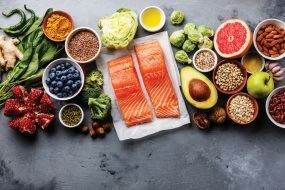 Dana Tegeler, athletic trainer at Clear Creek High School, was among the first to sign the “Strike Through Cancer Wall” during Clear Creek High School’s football game against Brazoswood on Oct. 9.